The SBom Joycard (エスボン ジョイカード, model no. 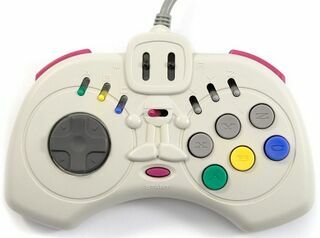 HC-735) is a controller for the Sega Saturn manufactured by Hudson Soft. It was built mainly with Saturn Bomberman in mind, and was often distributed with the game along with the SBom Multitap in Japan, where it remained exclusive. The SBom Joycard functions exactly like an ordinary Saturn controller, however has nine turbo switches and a moulding of Bomberman on its shell. The turbo function claims to be able to output 26 "shots" per second. It also features a switch in the center that when put into "Hu Position", unlocks hidden features in Hudson Soft games.